Most of the renewable energy buzz today is about electricity generated by solar panels and stored in lithium-ion batteries. 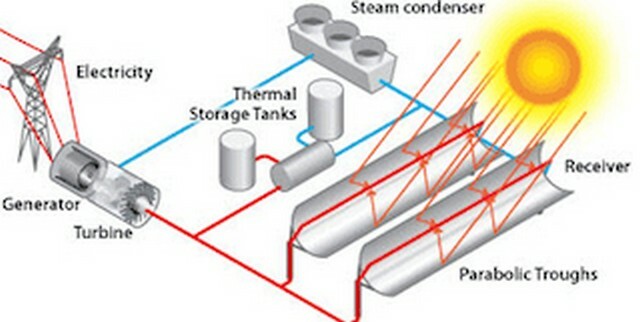 But there’s another kind of solar power — concentrated solar thermal power, better known as CSP. CSP is a lot like using a magnifying glass to burn your initials in a piece of wood. It uses mirrors to capture sunlight and reflect it toward a central focal point. It’s what happens when it gets to that focal point that sets it apart from photovoltaic systems. The temperature of the concentrated sunlight is so high, it can be used to heat a thermal fluid like oil (non-fossil fuel oil will do) or molten salt. In fact, it can make that fluid hot enough to convert water to steam and that steam can turn electric generators. To put it differently, if you throw in a good mechanism to store that heat, CSP combines solar electricity and storage in one system. Proponents say this storage system is several times more efficient than battery storage and therefore costs less in the long run — 20 to 100 times less, according to a report in Think Progress. According to the International Energy Agency, 11% of global electricity will be generated by concentrating solar thermal power in 2050. Its findings are contained in its 2014 CSP Technology Road Map. Stanford and several other universities have just issued their Solutions Project plan for how the US can get to 100% renewable energy by 2050. Stanford professor Mark Jacobson says CSP is expected to provide 11% of the power needed to meet that goal. 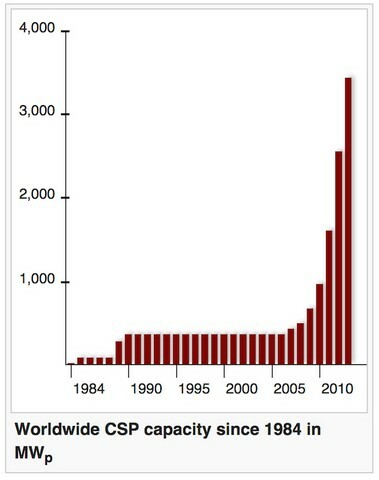 CSP is gaining favor because of its cost benefits vis a vis solar panels. In fact, the number of CSP installations is expanding rapidly, driven by the fact that it provides such inexpensive storage capability. A 2014 independent market analysis projected that the global CSP market will see “phenomenal growth of 19.4% computed as a compound annual growth rate between 2014 and 2020.” A global CSP market that was worth $2.5 billion in 2013 would hit nearly $8.7 billion by the end of 2020. That calculus could change if the price of storage batteries drops or if the number of electric vehicles on the road rises dramatically and all those vehicle batteries get integrated into the grid. But based on what we know at the moment, CSP will be an important part of the world’s transition away from fossil fuels. How Do Solar Panels & Solar Energy Work?